The PECAN (Plains Elevated Convection at Night) campaign is envisioned as a multi-agency project (NSF, NOAA, NASA, DOE) designed to advance the understanding of continental, nocturnal, warm-season precipitation. PECAN will focus on nocturnal convection in conditions over the Southern Great Plains with a stable boundary layer (SBL), a nocturnal low-level jet (NLLJ) and the largest CAPE (Convectively Available Potential Energy) located above the SBL. Thunderstorms are most common after sunset across this region in summer and much of the resulting precipitation falls from mesoscale convective systems (MCSs). Nocturnal MCSs may produce heavy rainfall; their intensity is correlated with the NLLJ. To date, an accurate prediction and an in-depth understanding of elevated convection in this environment remains an elusive goal.Studying the NLLJs observed during PECAN is one focus of our research group. Great Plains NLLJs are identified as southerly wind speed maxima within the first several hundred meters above ground level, and can stretch from Texas to Canada. The jets typically form around sunset, can reach maximum speeds of ~20m/s a few hours later, and dissipate around sunrise. NLLJs transport a lot of moisture from the Gulf of Mexico to the agricultural Great Plains regions, and can feed directly into developing storms. 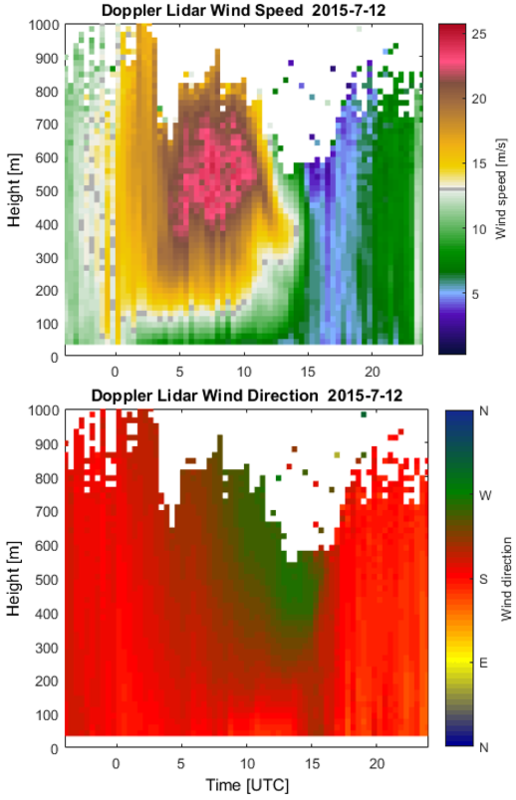 Observations from Doppler and water vapor lidar as well as other instruments make the PECAN data a great opportunity to improve our understanding of this important feature. We will also compare current theoretical models of NLLJ wind speed and evolution to PECAN observations. This project will extend to east coast NLLJs, which are vital to air quality and ozone transport. 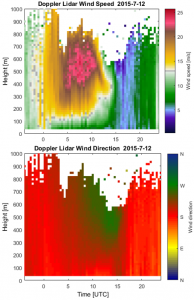 The PECAN data set also represents unprecedented high-resolution, multi-instrument observations of bore waves. A bore wave is a gravity wave that propagates outward from a convective column along the “surface” of a stable atmospheric layer. The wave induces large changes in the state of the atmosphere on the time scale of a few minutes as each wavelength passes by a given point on Earth. Water vapor observations from NASA’s ALVICE lidar for the July 12, 2015 NLLJ. This shows the sudden jump in moisture being transported across the Great Plains with the formation of the jet around 0 UTC. This causes instabilities that can lead to severe weather and moisten the upper troposphere as a precondition to severe storm development. Critical changes in CAPE caused by such waves of particular interest.Other projects include studies of the mixing layer (ML). This is primarily driven by a newly developed algorithm for retrieving ML height from coherent Doppler lidar, which will be used in conjunction with surface fluxes and other measurements to study the mixing of moisture and aerosols during NLLJs and other PECAN events. Smog Blog is Back Online. Good AQI in Baltimore.